Busch Gardens Tampa Bay‘s brand new Spin Coaster, Cobra’s Curse, is opening this Summer. I was able to get some video over the weekend showing off the completed track, the innovative vertical lift being tested, and a sample spinning car they have on display, plus a few shots of some cuddly, (and some not-so-cuddly) animals. Cobra’s Curse is being touted as a “family coaster,” but boasts some incredible features including a vertical elevator lift that takes riders up 80 feet to start the ride from the top, speeds up to 40 mph, and several key points in the ride where your car turns backwards, forwards, and even freely spins during the three and a half minute journey. Check out the video below, along with concept art, coaster specs, and construction snapshots. And stay tuned for more theme park updates coming soon! See all that makes this spin coaster the only one of its kind in the world! Join us at Busch Gardens Tampa Bay as Cobra’s Curse strikes this summer! This new attraction will be located in the Egypt area, near Montu. The first experience on this ride is a lift that is one of a kind! This vertical lift functions in a similar way to an outdoor elevator and will take riders up in their coaster car to put them face- to-fang with the 80-foot Snake King. 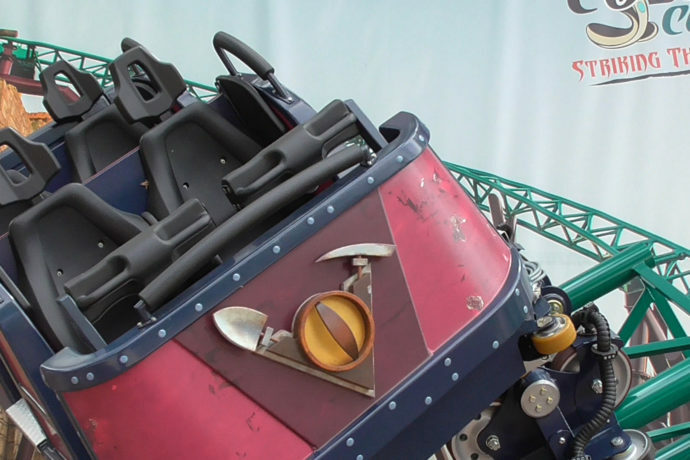 The Cobra’s Curse ride experience unfolds in chapters: First, you will be facing forward for the first third of the ride and then be turned backwards for the second segment. Finally, for the final third of the ride, you’ll free spin into frenzy. The air-conditioned queue line features an exhibit with live snakes, interactive elements and projection mapping technology to tell the story of the Snake King. Ride duration will be more than three and a half minutes reaching top speeds of 40 mph through more than 2,100 feet of track, (70 total track segments). This spinning family coaster can accommodate anyone 48 inches or taller to ride alone or 42 inches with parent or guardian. Is that a snake inside? Or a corrugated pipe? Cobra’s Curse will be the bee’s knees! Cannot wait until this innovative new attraction opens in a couple months! That’s all for this update. Check out our last Mako update at SeaWorld Orlando, with full track in place and area theming! Check out all our Cobra’s Curse updates here and subscribe to the RSS Feed to stay on top of Central Florida theme park news!